Neither the province of Cortona nor the calanchi country where Umbria and Lazio collide figures largely in the notional map of the wine world that most of us carry in our heads. 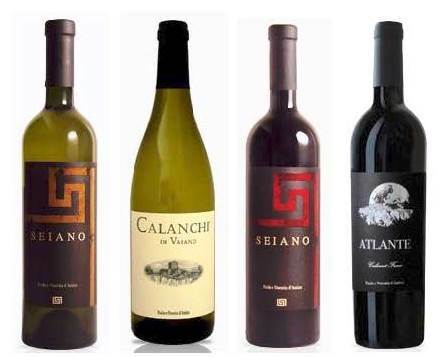 Yet excellent wines flow from both of them, though seldom encountered here – a situation importer/distributor Tony di Dio is hoping to change. Over a lunch at Gotham restaurant, he introduced me to his newest protégés, Baracchi, from Cortona, and D’Amico, from the UNESCO-protected calanchi district. Both make very drinkable and enjoyable wines, from quite different grapes but in similarly elegant styles. The Cortona DOC territory lies in extreme eastern Tuscany, just south of Arezzo. Its western end butts right up against the Vino Nobile di Montepulciano vineyards. Not far from the city of Cortona, the Baracchi family runs a total Tuscan enterprise: vineyards and winery; olive groves; a Relais and Chateau Hotel with a Michelin one-star restaurant and spa. Their wines reflect an emphasis on elegance, which started with a surprising-to-me brut spumante made from 100% Sangiovese, Brut Rosé Metodo Classico 2012. This was crisp and fresh and, yes, elegant on the palate, with excellent perlage and delightful wild berry and sottobosco scents and tastes – a lovely aperitif. O’Lillo 2012: The Cortona zone was originally designed as a home for international varieties, and that remains its primary vocation. This balanced, elegant, and fine wine results from the blending of equal parts of four varieties: Merlot, Syrah, Cabernet sauvignon, and the native Sangiovese. No wood at all here: The wine is fermented and aged six months in stainless steel. Smeriglio Sangiovese 2012: By contrast, this wine is aged 12 months in new barriques. The good news for me was that I and it weren’t overwhelmed by wood. In fact, it was quite lovely on the palate, with good Sangiovese character and fine structure. 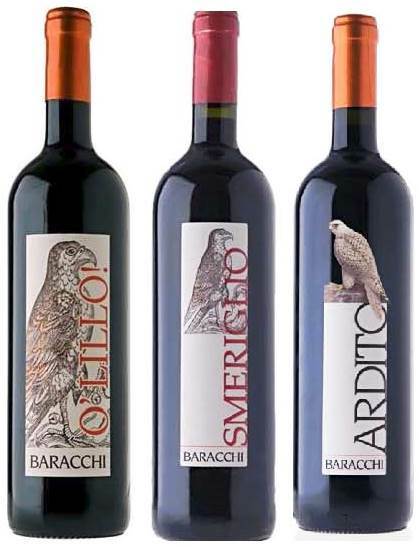 Ardito 2010: The Baracchi family regard this wine as their masterpiece. It is a 50/50 blend of Syrah and Cabernet sauvignon, aged for 24 months in barriques. The latter fact caused me some serious – but as it turned out,groundless – apprehension before I tasted. The Syrah was evident in the peppery nose; the barriques weren’t, nor were they on the palate, which was fine and deep, with complex fruit and earth flavors. Surprisingly restrained and fine. The D’Amico properties lie in extreme northern Lazio, right near the border with Umbria and the Orvieto DOC zone. As I noted above, the vineyards lie with within the UNESCO-designated zone of calanchi, stark vertical hillsides of eroded lava and tufa, both of which form large components of the soil throughout the area. That’s not ideal for many other crops, but it can be wonderful for grapes, because of the intense mineral/earth traces that the vines absorb and transmit to their fruit. The four D’Amico wines I tasted all showed that marked minerality and an easy, elegant palate that matched well with our various luncheon dishes. These are truly food-friendly wines. Seiano Bianco 2013: This is a blend of Grechetto and Sauvignon blanc, a round wine, soft on the palate, with excellent white fruit and – happily – none of the too-often-encountered extreme grassiness and cat’s pee that Sauvignon can be guilty of. Here the Sauvignon is under control, so the Grechetto’s fruit and the vineyard’s minerality predominate. Calanchi Chardonnay 2012: An interesting wine, and it’s been a long time since I’ve said that about a Chardonnay. Here, while there are some tropical fruit notes in the nose, the flavor is dominated by intriguing mineral flavors – limestone and slate, for instance. Medium body, round, and companionable with food. It kept opening in the glass, getting richer as the lunch went on. Seiano Rosso 2013: Another interesting wine that continued to open and change in the glass. A blend of Sangiovese and Merlot, very fresh in the nose and on the palate, with soft tannins and a good acid balance to keep it supple. Atlante 2011: This was the most unexpected wine of the day for me, a 100% Cabernet franc. Great nose, with tobacco and cedar predominating. The palate followed suit, and although that may sound as if this was a thoroughly French wine, it wasn’t: Its bright acidity and equally evident minerality marked it as totally Italian. A quite successful adaption of a French grape to an Italian zone. This was for me an eye-opening sequence of wines, showing some of the best adaptations of international grape varieties to authentically Italian styles of winemaking that I have encountered in a long while. Don’t you just hate it when someone challenges your prejudices? This entry was posted on March 30, 2015 at 7:00 am and is filed under Italy, Lazio, Tuscany. You can follow any responses to this entry through the RSS 2.0 feed. You can leave a response, or trackback from your own site.